It will be rocking Thursday at Floyd Casey, but I have not seen the consistency from the Oklahoma offense week-to-week to go up against the ridiculously good Baylor offense. They can slow them a little, but not enough. Will the Ducks exact their revenge? I think they will. 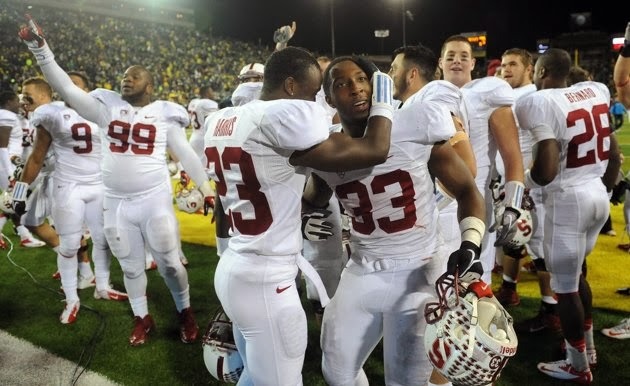 I really like Stanford but I don't think their offense is strong enough to keep up with Oregon. Is Auburn really this good? I'm not entirely sold, so I think they better be on upset alert this week. They will squeak it out, though. The Nittany Lions have been a little hit or miss this year, but I still think they are better than Minnesota. The Red Raiders need a bounce-back after two losses and I think they will this week in Lubbock. To get to bowl eligibility, the banged-up Gators need this game, and Vandy is a solid club. I do think having this game at home tilts it to Florida. We have seen Arkansas really struggle this year in conference, and that's not going to change. The Huskers needed a Hail Mary to escape Northwestern while the Wolverines were a disaster offensively against Sparty. Michigan does have the defense to bounce back and cause some problems for Taylor Martinez at home. When are the Badgers going to start getting the respect they deserve? Dan Mullen and co. could really use a big upset like this one, but that's not gonna happen. Neither of these clubs can stop anybody, but Indiana is more consistent with the football. This is one I could really see go either way, but with how banged up the Terps are, give me the Orange. The Knights should win this one but don't count out an underrated Houston squad. Are the Hokies unraveling? I think so, and that's a good sign for the Canes who need to rebound from the loss in Tallahassee. However, it will be closer than some think. I do think the Mountaineers will make it interesting, but little more. When will the Sun Belt start being called the Fun Belt? Are the Crimson Tide the best team in the country? Even as they have looked vulnerable this year at times, I still think you have to say yes. And while it is always tough to win in Tuscaloosa, and LSU is famously all over the place, I like the Tigers to pull off the upset. Zach Mettenberger will be able to throw the ball against an inconsistent Bama secondary and I think he will lead LSU to a big win. The Bruins got a much needed strong performance against the Buffs and I think that will continue. Interesting game in Sillicon Valley, I give the slight edge to the Spartans.